Feilaiger 30mm Living Memory Locket Floating Charm Necklace – Circle Alloy Pendant – Glass Rhinestones Surface Magnetic Closure – Resizable Link Chain DIY Jewelry. 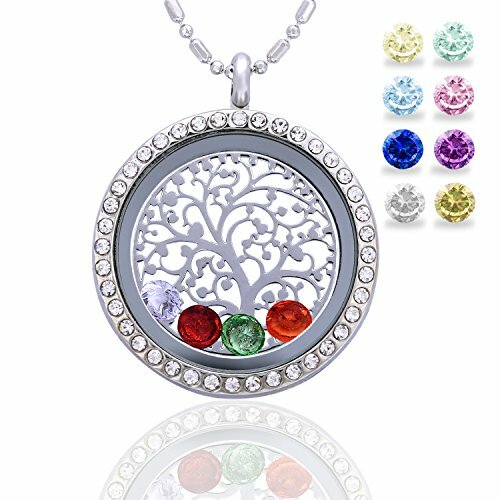 Material:Alloy, Glass, Rhinestone,Magnet.Circle ally pendant which is environmental elctroplated to protect your skin from allergy.Shinning rhinestone adds fashion element.Highly transparent glass surface.Easy to open and close and stays securely closed with internal clips and magnetic closure.Small photos and any other cute articles can be inserted.Compatible with all major brand charms.Floating charm can be a ideal present for anybody. It’s certainly an exceptional gift for the buddies, family, relatives, parent, and even to your someone special. Dimension:The length of the one side chain belt is 38cm,5cm left to adjust.Resizable link chain DIY jewelry gold.The external diameter is 30mm while the inner diameter is 23mm.Quantity: 1 Floating Charm Locket Pendant + 1 Free Link Chain. Technology: Environmental protection plating, Non allergic. Design: Clear glass double sided face locket opens to add charms of your choice, Magnetic closure. Fits: Locket can open up to place image inside, Floating charms,pictures and pendant can be customized at any time. Package: Comes with a free Black Velvet Gift Bag named “Feilaiger” on it.